In the build up to the London Olympics in 2012, the International Paralympic Committee, asked Motivation to design an affordable sports wheelchair, that athletes from around the world could purchase. The wheelchair was to be at the fraction of the cost of those supplied by other ‘specialist’ wheelchair manufacturers. The result was Motivation’s Multisports Wheelchair, which has been designed for a wide range of users, from school children to adults. The affordable Multisport Wheelchair, is designed to make sport accessible to disabled people. There are two models, which suit basketball, tennis and no doubt other sports and activities. The backrest is adjustable, ensuring that it fits a range of sizes. The wheels have been designed to be quickly released and changed. 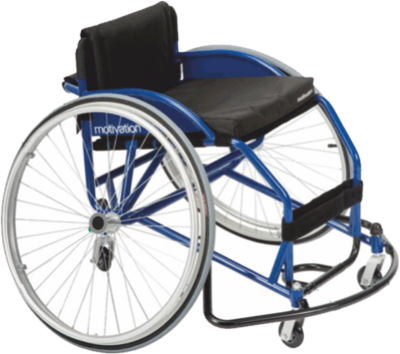 The inclined / angled wheels, add to the stability of the wheelchair, especially during sporting activities. The back wheel, also called the caster, is also adjustable, adding stability. The frame is manufactured from common tubular steel, which is relatively lightweight. It is highly manoeuvrable, allowing it to used successfully in sporting activities. It is robust and strong, able to withstand the type of rough treatment, that occurs in wheelchair sports. The removable toe guard at the front, keeps the users feet out of harms way. The wheelchair is fraction of the price of ‘professional’ sports wheelchairs and yet competes at the same level.